Linger is the second book in the Wolves of Mercy Falls Trilogy, and it is the continuation of Grace and Sam's story, with two more perspectives. Just as they thought that everything was fine, that their love story finally came to its happy resolution, new problems are on the horizon. Sam must deal with a choice Beck has made, a choice that brought a new character: Cole. Cole is one of four narrators readers will come across in this novel as Sam and Grace's story intertwines with the lives of Isabel and Cole, who are connected by their own personal struggles. In addition, they add to Grace and Sam's plot just as much. But together, Grace and Sam are going to have to face an untimely reality that may separate them; for something unavoidable isn't quite right. 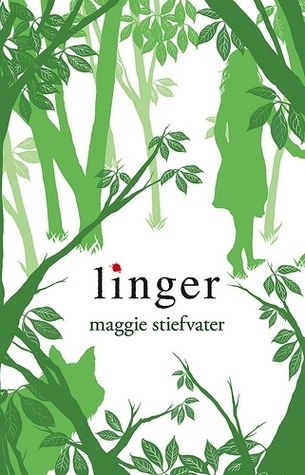 When I first started reading Linger, I had rather low expectations. With the introduction to a new male character, I expected him to be a contender for Grace's love since this happens with many second books in paranormal romance series', but thank goodness, I was wrong. Cole, a new character in the Wolves of Mercy Falls Trilogy, really boosted my opinion for this book. I really enjoyed reading his narrations as well as Isabel's narrations, and their complex relationship kept me interested more than Sam and Grace's story. In some odd way, it was refreshing to read about two very imperfect people. With that being said, the main plot with Sam and Grace is very, very predictable. The general plot in captivating in some ways, but the author gives so many hints but takes so long to get to the point. I knew what was going to happen in the end, the only thing that was a little surprising was the manner in which it happened. Although I was correct in my predictions, the climax was still quite effective since it was so full of action (which was something I did not predict). Part of the reason why I may have preferred hearing from Cole and Isabel is that I really don't care much for Grace. I cannot relate to her whatsoever when it comes to much of anything. Plus, I got a bit frustrated with her towards the end. Though I understand that she's angry that her parents (who do an awful job of parenting) suddenly forced themselves into her life after years of absence, she went about her anger in a rather... less smart way. Seriously: You get in trouble once for something that every parent on the planet would get angry about. You can at least pretend to follow through with the punishment. Really, it's no wonder they punished her over and over again - she's not very sneaky! Sure, this might be the closest we get to real life, but it's very irritating as a reader. More than anything, this book was a bit too gushy at times. I know I mentioned this in my review of the first novel of this trilogy, Shiver, but it got worse. Grace nearly drove me insane with her constant whining: "Boohoo I miss Sam; I haven't seen him in two whole days!" But, the generally corny vibe didn't just affect her, it also affected Sam. He's no different. (However, I guess I like Sam, but maybe I just pity him because of his past...) Even the writing was affected by this element. Is Maggie Stiefvater a good writer? I think so, but the gushiness really took away from it. I think the writing would have done much better in a different setting. I'm realizing that Cole and Isabel's story lacked all of the things I just complained about. Even so, the climax of the book does seem to pay off any problem I had with Sam and Grace since the engrossing elements of their story is highlighted. The way that both stories have merged make it special; Maggie Stiefvater knew what she was doing. In truth, this wasn't a bad sequal, but it wasn't the best. It was on the fence. Readers will be hung over a cliffhanger and likely want to see what happens next, just as I do. After reading this book, my expectations for the third book, Forever, aren't really expectations at all since Linger was a a bit in-between. Forever could be as in-between as this installment, as good as Shiver, absolutely beautiful, or absolutely terrible for all I know. I can't tell at this point. All the more reason for me to go ahead and read the next book. Linger will somewhat satisfy those who read the first novel in this trilogy with its new character and the entertainment it brings. Though it was predictable and far from a perfect novel, it's entertaining enough nontheless.